PERSONAL FUNDRAISING PAGES ARE TEMPORARILY DISABLED AS WE TRANSITION TO A NEW, MORE EFFECTIVE PERSONAL FUNDRAISING PLATFORM. THESE NEW FUNDRAISING PAGES WILL BE UNVEILED SOON. THANK YOU FOR YOUR PATIENCE AND SUPPORT! Why create a fundraising page? All donations great and small are a blessing to The Fuller Center, its projects and its partner families. A fundraising page is one way to make your support grow by enlisting friends and family to the cause of The Fuller Center. Have a special fundraiser in honor or in memory of a loved one. Raise money for a Global Builders trip or Student Builders event. 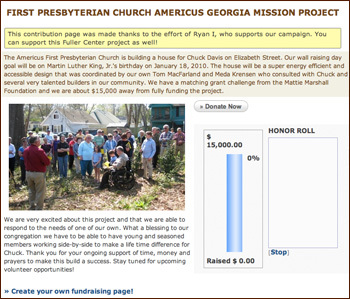 Enlist your church or family to raise money for a home in your community. Ask people to donate to The Fuller Center in your name for your birthday, wedding or another holiday. Ask people to sponsor your sporting activity. What is a personal fundraising page like? Donors can post personal messages, receive tax receipts, learn about The Fuller Center and get involved with us. Or, they can maintain their privacy and remain anonymous. You can include a personal message and track your progress. You can start your own campaign and encourage others to start their own fundraising pages.